Whether it’s in France or in the U.S., in London or in Manchester, Ian Rayer-Smith’s work is strong and unforgettable - a remarkable fusion of the surreal, the abstract and the figurative. When he’s not travelling the world to exhibit his work, the painter and sculptor divides his time between Manchester, where he is based, and rural north Shropshire. Ian is the winner of the It’s Art Call 2017 International Painting Competition and his work can be seen in several art fairs and galleries across Europe. He is often featured in Interior Design projects and magazines, such as the GQ Style AW2017. We had a chat with this talented artist, who started painting relatively late in life after a career in business. Initially it was a distraction from pressures of business life. But, slowly, painting began to take over – lucky for us! Home Staging Association: When did you start your career as an artist? 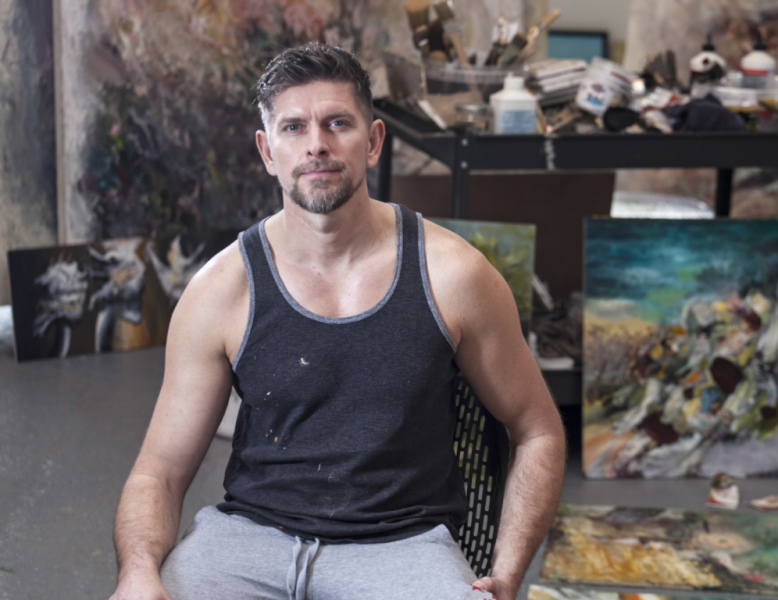 Ian Rayer-Smith: I started painting ten years ago, I’ve never really stopped. I graduated from art school as a mature student and have now been working as a full-time artist for nearly four years. HSA: Would you consider creating art a lifestyle? IRS: Definitely! It could never be described as a nine-to-five job. I’m always thinking about my work and finding inspirations and ideas everywhere. I like to work creatively every day, which means that I never break the flow. HSA: Tell us about the colours on your palette and anything new you have been experimenting with. IRS: As an artist you tend to get attached to certain colours and combinations and for the last year or so I’ve become obsessed with pink and green. I feel it’s important to use bold vibrant colour. I like walking into the studio in the morning and being confronted by intense colours. HSA: What is your process when painting? IRS: A version of controlled chaos. I like to work rapidly. I never work on one painting at a time. Having said that, some paintings still take many months to finish. My main aim is to try not to spend too long on any single painting at one time. I have to keep moving from one to another, then back again to reappraise progress. That keeps things very lively. HSA: Where do you get inspiration from? IRS: Everywhere. I’m as much inspired by Renaissance painting as by the Abstract Expressionists. But I’m also inspired by so many things in contemporary visual and musical culture. It all feeds into my work. I like my work to have a classical feel. HSA: Do you compare yourself with other artists and does that affect your creative process? IRS: Yes, I think all painters do, or perhaps it’s more accurate to say that they are influences. Throughout history, artists would learn by copying old master art works. Things are a little different today. Painters have to find their own unique way of working and expression. Painters need to know about the history of painting, as this helps us to constantly question and refine our own work. Ultimately, what any contemporary painter wants to do is to make a contribution to the subject of painting. HSA: Would you define your work as commercial? IRS: I suppose there is a commercial element to what I do. Thankfully, people are interested in owning my paintings and I have managed to attract some commercial success. But as well as selling work, as an artist I’d like to see my paintings in art museums and non-commercial galleries - that’s my dream. HSA: Do you have any tips on how to pick the right piece of art for a room? What should we keep in mind? IRS: A great piece will speak for itself, and so ought to work in any room. Also, art is such a very personal thing. Ultimately, you have to pick something you love. Once in a while you may come across a painting that totally captures you. Art fairs are great places to visit for variety, so you can really get a good range to look at, and often meet the artists and have a one to one experience and learn more about their work. HSA: Any upcoming exhibitions or workshops we should know about? Solo art exhibition from 8th February - 3rd August 2018. The Soden Collection, Shrewsbury, UK. Steidel Contemporary, Palm Beach, Florida, USA.